How Much Blood Do Holder and Soros Have on Their Hands? How much blood do Eric Holder and George Soros, who pays for many of the protests, have on their hands? There is Zemir Begic, the two murdered cops in Brooklyn, and now these two Missouri cops, who appear to be survivors. The toll is starting to mount. Isn’t it time for a Day of National Media Shame and Reflection? 81 Comments to "How Much Blood Do Holder and Soros Have on Their Hands?" Holder’s faux ghetto denunciations today were protesting too much. “I condemn violence against any public safety officials in the strongest terms.” What AGUS has ever had to say that? Isn’t that the strong assumption, the default rule? Holder’s statement betrays his bad conscience and knowing culpability. Didn’t this vile man already resign? Why are we still hearing his blathering? Because this narcissist is a lot like those women you know who turn 50 and have a birthday year. It's all about him and you just can't shut him up.
" “I condemn violence against any public safety officials in the strongest terms.” "
But no condemnation of the use of violence by "public safety officials" against those looted to pay their inflated salaries. Maybe the GOP can invite Netanhayu to Ferguson to give a speech on how the Iranian nuclear program must be halted. 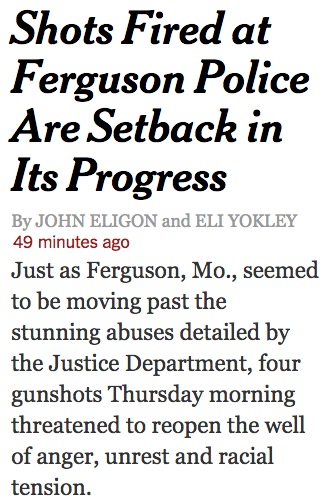 They’re acting like the targeting of policemen is a cause, not a result, of the unrest. Do they really want readers to think that this shooting is going to cause unrest? That it is the supporters of law and order who are rioting and not the “supporters” of Michael Brown? I must be misinterpreting this snippet or it must have been poorly worded, because surely the media knows we’re not THAT stupid. Right? The reader is supposed to be just reading the first sentence, or reading the first sentence and then letting his imagination read the rest of the story rather than his eyes. In that case, he concludes that the only way the shots would have reignited tension is if they were shot by the police. That newspaper is evil. I made this comment in The Huffington Post’s Black Voices section. “If you are anti-All Lives Matter and only support Black Lives Matter, than you are a racist because you basically believe that Blacks are the master race and everybody else is racially inferior and there for the world should only be outraged and angry when a Black person gets killed but not give a damn when a White person gets killed or when a Korean person gets killed for example. You are saying Nonblack lives are too racially inferior to feel any sympathy for. Jefferson, I'm with you. But you often write "than" when you mean "then". Google "then vs than" and try to find a webpage that lists common spelling mistakes. Spend a few hours studying the various common mistakes people make. Examples: its vs it's, there vs their. Mistakes like this *really* detract from a writer's credibility and it's downright demoralizing to read a comment with which I largely agree but with such simple errors. Again, no offense. Don't take it personally. It's just a fact and I'm trying to help someone with whom I likely mostly agree. Soros himself has directly corresponded with one of his not-so-major critics. So, maybe try to engage him with tough questions designed to show him wrong and see what happens. Much easier option: find a Soros lackey and work to discredit him or her. Engage him in debate or even entrap him. Force him to admit something that will make Soros’ efforts look bad to Soros’ base. Then, publicize it. Once again, not in the brainless Twitchy fashion but in a smart, big tent, pro-American, just-anti-far-left-not-anti-liberals way. I have a great deal of trouble believing that most Americans consciously support the Holder/Soros/Obama/etc campaign, yet I’m sure many support it by default simply because the loudest opponents are buffoons. Change that. Blacks and Left Wingers on sites like “Huffington Post” and “Black Atlanta Star” are worried that the shooting of 2 White cops in Ferguson are going to overshadow the racist White college students in Norman, Oklahoma story. They want the media attention to be put back on White people and not Black thugs who want to kill cops. I’d like to start a campaign to revoke Soros’s American citizenship and deport him as a undesirable immigrant. While we're at it, let's appropriate his assets and turn them over to VDare. The problem with deporting internationalist trouble makers is they just move to some other country and cause trouble there. As a particularist I think western countries need to establish a two-tier system of citizenship - one for those who support nation states and one for those who don't. Since internationalists don't respect national sovereignty why should they experience the benefits of full citizenship? I'm not suggesting all their rights should be taken away, but they certainly shouldn't be able to meddle in national politics. D’Andre Joshua, whose case still hasn’t been solved. The one who supposedly testified to the GJ. A writer for some online publication was murdered along the Fergaza Strip back in August. If you lived through the 60s, this dynamic is so familiar, its almost boring (between the spasms of anger). The more the mainstream political culture grants ( in the form of new Civil Rights Laws, court-ordered remedies, affirmative action, welfare), the more the underclass erupts in rage, destroying businesses, neighborhoods, public order. By that metric alone, Obama is the first truly Progressive President since LBJ: he has reignited underclass rage and empowered it, triggering some primitive savage instinct that preys upon weakness. It's back to the 60's all right, soon to be complete with Panther ambushes of cops, shootouts, police retaliation, rampaging riots, white flight, more social programs, tear gas in the streets, etc. All we'll need is another foreign war that drags on and there'll be white demonstrators in the streets also. Unlike the last time around we now have the mainstream media as well as the president and his DOJ accomplice egging things on, trying to inflame things even more, acting as arsonists. They actually want to see 'burn baby burn' make a comeback. Ah, nostalgia for the smell of gasoline and tear gas in the air. Imagine the NY Times made you flee your town? "Imagine the NY Times made you flee your town?" AFAIK, the MSM has followed the police line that Begich was murdered for “being in the wrong place at the wrong time”. Once I was in the wrong place at the wrong time, I got in the express checkout ans I had like 20 items. Naturally I was murdered. Oops, I guess I wasn’t. And it’s filthy lie that Begich was murdered because he was in the “wrong place” unless St. Louis is one giant no-go area. The whole “wrong place” narrative is so painully obvious. It’s a motiveless crime, complete random desire to kill, until you know that the killers were chanting “Kill the white people.” Then it all makes sense, it was ethnic cleansing, ironically targeting a Bosnian, but only because he’s white. And that’s why the truth is being kept buried. I am very grateful to you Steve for keeping this info out there. I see Carlos Slim has made the NYT more efficient already — this reads like a news story and editorial in one. It was 1 a.m. and Michael Brown Jr. called his father, his voice trembling. He had seen something overpowering. In the thick gray clouds that lingered from a passing storm this past June, he made out an angel. And he saw Satan chasing the angel and the angel running into the face of God. Mr. Brown was a prankster, so his father and stepmother chuckled at first…And the black teenager from this suburb of St. Louis, who had just graduated from high school, sent his father and stepmother a picture of the sky from his cellphone. “Now I believe,” he told them. More efficiency here — that’s journalism and poetry in one. “Now I believe,” he told them. "... I believe Ima smoke a little more of this PCP." We need to figure out how to sue George Soros for this. Take him down for every last cent. STUNNING ABUSES released in this SCATHING report! How many versions of this phrase have been written or uttered in the last few days? It’s like living in bizarro world. Clearly you have never had to pay a parking ticket, you insensitive lout! I'd like to start a campaign to revoke Soros's American citizenship and deport him as a undesirable immigrant. While we’re at it, let’s appropriate his assets and turn them over to VDare. I made this comment in The Huffington Post's Black Voices section. "If you are anti-All Lives Matter and only support Black Lives Matter, than you are a racist because you basically believe that Blacks are the master race and everybody else is racially inferior and there for the world should only be outraged and angry when a Black person gets killed but not give a damn when a White person gets killed or when a Korean person gets killed for example. You are saying Nonblack lives are too racially inferior to feel any sympathy for. Jefferson, I’m with you. But you often write “than” when you mean “then”. Google “then vs than” and try to find a webpage that lists common spelling mistakes. Spend a few hours studying the various common mistakes people make. Examples: its vs it’s, there vs their. Mistakes like this *really* detract from a writer’s credibility and it’s downright demoralizing to read a comment with which I largely agree but with such simple errors. Again, no offense. Don’t take it personally. It’s just a fact and I’m trying to help someone with whom I likely mostly agree. But that article is from August 2014. A lot of water over the dam since then; maybe even the dweebs at National Review have noticed. I am puzzled why anyone would work in a police force in a municipality with a majority of people belonging to any group with a high level of violence. Even if that wasn’t the case at one time, it was known by every cop in Ferguson that things had changed. Why not just quit and move to another city? Around here, at least, it's ludicrously hard to get a police job in a wealthy, safe town. Any time a spot opens up, over 100 applicants sit for the police test, and only the ones with the top scores make it to the interview stage. That there were a slough of cops onsite and the shooter(s) are still at large speaks volumes to their policing abilities. After everything that benighted burg has gone through, the fact that there's been no ShotSpotter technology deployed speaks to their incompetence. Because a lot of guys think police work and getting down and dirty with violent criminals is fun. And thank God for those guys. Bra Girl, the main attacker, has been arrested. She is Aniah Ferguson(! ), aged 16. Since turning 16 last July the lovely lass has been arrested six times. Among other things she was charged with attacking her grandmother and twice violating orders of protection issued to Granny. Most recently she was charged for slashing her brother’s arm with a knife. Oh, Aniah has a year-old child. The victim, 15-year-old Ariana Taylor, seems to be enjoying every bit of her newfound fame. She’s been posting selfies on Facebook which, despite the severity of the attack, show her looking none the worse for wear. Even if that wasn't the case at one time, it was known by every cop in Ferguson that things had changed. Around here, at least, it’s ludicrously hard to get a police job in a wealthy, safe town. Any time a spot opens up, over 100 applicants sit for the police test, and only the ones with the top scores make it to the interview stage. The most qualified candidates end up in the safest areas, and have nothing to do. How efficient! Then they get bored, drink, beat the wife, etc. The gals from the Brooklyn beat-down attend Erasmus Hall High School, which used to be an elite institution. Barbra Streisand went there. I think Bobby Fisher, too…. Much stuff about lower-end boys. Gee, I have no idea what happened to Erasmus since it went from 99% Jewish to 99% black. It's a complete mystery to me why the scores have declined drastically and violence has increased exponentially. I have a working theory that a reduction in the quality of the teaching staff has caused this decline, but I'm really not sure. When you feed the mob, it grows hungrier for more. There were also scuffles among the protesters — at one point, one demonstrator struck another, fighting over an accusation that one of them was exploiting the events in Ferguson for financial benefit. Another, larger disturbance broke out a short time later. Given sufficient time, the mob will devour each other. The problem is that there will be A LOT of collateral damage to the innocent. Damn those gunshots and all their threats that they (the gunshots) enact. My all-time favorite insulting bait-and-switch horror from the NYT was the article about motherhood written by a post-op transexual “woman” who is sad because her toddler son is confused and sad about her metamorphosis and the article ends with the summary that MOTHERHOOD = SUFFERING. Because that toddler is so selfish as to wish his daddy had remained a daddy and not became his second lesbian mommy. And it was their special Mother’s Day article. I can’t believe the authorities allowed a march/protest tonight. The shooter or shooters are still on the loose. If there was ever a reason to shut it down, this is it. I knew I shouldn’t have cleared out the Ferguson people from my Twitter feed so soon. Actually I live in such a town and the result is more affirmative action hires. If a cop beats his wife, it's because he has PTSD and he should be retired on disability at full pension. The cop who shot the kid in Madison, WI had a base salary close to $90k with overtime putting him into six figures. He also got a commendation and monetary award for the last guy he shot dead, a middle-aged white guy on his own property (guy had no priors and had a BB gun-- his wife told police that). I know a cop in his mid-40's who retired with a six-figure pension on disability and just started a six-figure consulting gig with DHS. I.e., white, cisgendered, heterosexual, gentile males are benefitting big time from the paranoia of the elites and their obsession with self-preservation. Let the Asian and East Indians corner the market of 100-hour-per-week, $90k tech jobs. It’s back to the 60’s all right, soon to be complete with Panther ambushes of cops, shootouts, police retaliation, rampaging riots, white flight, more social programs, tear gas in the streets, etc. All we’ll need is another foreign war that drags on and there’ll be white demonstrators in the streets also. Unlike the last time around we now have the mainstream media as well as the president and his DOJ accomplice egging things on, trying to inflame things even more, acting as arsonists. They actually want to see ‘burn baby burn’ make a comeback. Ah, nostalgia for the smell of gasoline and tear gas in the air. I am willing to accept that the NYT-types are crazy enough to believe their own shtick; but surely Soros has no bone in this matter? Surely it’s ridiculous to accept the idea that Soros is a lover of, eh, the underprivileged. Rather, he seems to be either an operator for those who really call the shots, or a relatively high-profile representative of those who call the shots. Which begs the question: If those who call the shots have indeed decided to provoke racial tension in the United States, what is their goal? Why are they doing this? They’ll never apologize in public. There is opportunity in chaos. War is the health of the State. It's a pretext for usurping power from the people. The media have no shame. You must know that by now. I don’t know Steve? How much blood does the Ferguson police chief have on his? Two police officers Thursday morning threatened to reopen the well of anger, unrest and racial tension, as they blocked the paths of two small projectiles passing through a community already troubled by previous acts of police overreach. The dead and injured police are the tip of a very large ice-berg. If you tell a low-IQ, self-righteous and violent group like blacks that they’re oppressed by evil Whitey, they will take steps to redress the balance. 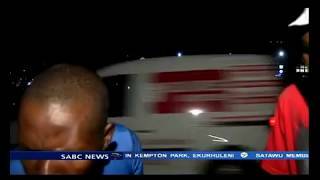 Black-on-white murders, beatings and rapes, day after day after day while the media pretend the only problem is white racism. South Yorkshire Police knew hundreds of young girls were making claims of sexual abuse in Sheffield but did not act, an ex-police officer has alleged. Documents and interviews with ex-officers suggested the force failed to pursue a number of child sexual exploitation (CSE) inquiries. It also ignored intelligence that girls as young as 12 were being raped and assaulted, the officer told the BBC. Dr Richard Stone has worked as an anti-racism and inter-faith campaigner in the UK. He has been in the campaign arising around the Stephen Lawrence murder and is a friend, adviser and confidant of Doreen Lawrence on a continuing basis. Dr Stone served as a Cabinet Advisor to the Mayor of London, President of the Jewish Council for Racial Equality, and spent five years on the Runnymede Trust’s ‘Commission on British Muslims and Islamophobia’, from 2000 to 2004 as chair. He has also been a trustee and vice-Chair of the Runnymede Trust and a Council and Board member of Liberty. For 14 years he has been the chair of the Islamophobia Commission, set up by the Runnymede Trust in 1996, working with British Muslims. He was a member of the Home Office’s Working Groups on Tackling Extremism Together. CC. Unit 8200, NSA, GCHQ. I see Carlos Slim has made the NYT more efficient already -- this reads like a news story and editorial in one. It was 1 a.m. and Michael Brown Jr. called his father, his voice trembling. He had seen something overpowering. In the thick gray clouds that lingered from a passing storm this past June, he made out an angel. And he saw Satan chasing the angel and the angel running into the face of God. Mr. Brown was a prankster, so his father and stepmother chuckled at first...And the black teenager from this suburb of St. Louis, who had just graduated from high school, sent his father and stepmother a picture of the sky from his cellphone. “Now I believe,” he told them. More efficiency here -- that's journalism and poetry in one. Holder's faux ghetto denunciations today were protesting too much. "I condemn violence against any public safety officials in the strongest terms." What AGUS has ever had to say that? Isn't that the strong assumption, the default rule? Holder's statement betrays his bad conscience and knowing culpability. Didn't this vile man already resign? Why are we still hearing his blathering? Because this narcissist is a lot like those women you know who turn 50 and have a birthday year. It’s all about him and you just can’t shut him up. After everything that benighted burg has gone through, the fact that there’s been no ShotSpotter technology deployed speaks to their incompetence. An obsessive focus on white racism by racial activists, the Democratic party, and the media encourages hate crimes against whites. It has been shown that the “disparity” in black/white arrest rates in Ferguson is common throughout the country. 89 ....psssht, a drop in the bucket. "At the same time, we have a gun lobby that controls policy and forces this violence down the throats of the majority who would like to live in a less gun violent world." See, it was the NRA that shot those cops. If we could just get rid of the NRA and allow majority rule (get rid of those pesky super-majorities for amending the Constitution and turn it into a "living document") then violence would disappear. STUNNING ABUSES released in this SCATHING report! How many versions of this phrase have been written or uttered in the last few days? It's like living in bizarro world. "four gunshots Thursday morning threatened to reopen the well of anger, unrest and racial tension." They're acting like the targeting of policemen is a cause, not a result, of the unrest. Do they really want readers to think that this shooting is going to cause unrest? That it is the supporters of law and order who are rioting and not the "supporters" of Michael Brown? I must be misinterpreting this snippet or it must have been poorly worded, because surely the media knows we're not THAT stupid. Right? “the two murdered cops in Brooklyn” – Other then traveling to NYC so he would be famous the pattern was the same as most American shooting sprees. He shot his old lady down, then moved on to people he hated (usually employers but in this case cops) and then killed himself. As for Soros, why not sue him? Question of the day: Let’s say they catch the Ferguson shooter this afternoon. Who is the bigger media-villain going forward? A. The 19 year old drunk frat boy singing a stupid racist song on a party bus. B. The predator who ambushed two cops, shooting both–one in face–in an attempt to kill them. Great question. You can check Twitter- my guess is the frat boy's negative comments are 20x the Ferguson cop shooter. That could be a low estimate. This one is easy, but not exactly for the reason you think, but this instead: It's no fun to trample on the already downtrodden. Whoever they arrest for shooting at the cops will just be (I would be willing to bet) just another POS with a record a mile long. If he hadn't shot the cop, he would be going to jail soon anyway or end up dead in some drug altercation. The jails are already full of his kind - we got a million of them. But, to take a promising young man with everything before him, a member of the elite (not really - despite the tux he was probably more of a hick than an elite) and to show HIM that he is no better (in fact worse) than the rest of us - THAT's pure schadenfreude joy. Wolfe long ago spoke of the Great White Defendant. In his book, he was a Wall St. banker who lived on Park Avenue, but in our reduced circumstances, you gotta take what you can get - "White Hispanics", cops who shoot in self-defense, frat boys from hick states, etc. Question of the day: Let's say they catch the Ferguson shooter this afternoon. Who is the bigger media-villain going forward? B. The predator who ambushed two cops, shooting both--one in face--in an attempt to kill them. Great question. You can check Twitter- my guess is the frat boy’s negative comments are 20x the Ferguson cop shooter. That could be a low estimate. The Democrats’ means of of production is social trouble because they supply social services. The more trouble the better. Is there any more news on the shooting? Calibre of bullets? Distance from targets, etc.? Gee, I have no idea what happened to Erasmus since it went from 99% Jewish to 99% black. It’s a complete mystery to me why the scores have declined drastically and violence has increased exponentially. I have a working theory that a reduction in the quality of the teaching staff has caused this decline, but I’m really not sure. An obsessive focus on white racism by racial activists, the Democratic party, and the media encourages hate crimes against whites. It has been shown that the "disparity" in black/white arrest rates in Ferguson is common throughout the country. 89 ….psssht, a drop in the bucket. See, it was the NRA that shot those cops. If we could just get rid of the NRA and allow majority rule (get rid of those pesky super-majorities for amending the Constitution and turn it into a “living document”) then violence would disappear. If a cop beats his wife, it’s because he has PTSD and he should be retired on disability at full pension. The cop who shot the kid in Madison, WI had a base salary close to $90k with overtime putting him into six figures. He also got a commendation and monetary award for the last guy he shot dead, a middle-aged white guy on his own property (guy had no priors and had a BB gun– his wife told police that). I know a cop in his mid-40’s who retired with a six-figure pension on disability and just started a six-figure consulting gig with DHS. I.e., white, cisgendered, heterosexual, gentile males are benefitting big time from the paranoia of the elites and their obsession with self-preservation. Let the Asian and East Indians corner the market of 100-hour-per-week, $90k tech jobs. If we’re going to start counting bodies, we shouldn’t forget the ones from the Trayvon Martin farce either. There were a number of violent attacks resulting in hospitalizations. As for outright killings, I recall the college kid from Australia, Christopher Lane. I am willing to accept that the NYT-types are crazy enough to believe their own shtick; but surely Soros has no bone in this matter? Surely it's ridiculous to accept the idea that Soros is a lover of, eh, the underprivileged. Rather, he seems to be either an operator for those who really call the shots, or a relatively high-profile representative of those who call the shots. They'll never apologize in public. There’s probably been a lot more than the ones listed as well. One place I know about there was a house party of black teens that got fire bombed. The kid who did it wasn’t caught until some years later (he was at the party and had an argument over a girl which is the usual reason for most of these things) and in the interim the local media always claimed it was a race thing. Every time the incident came up in the local media the number of white kids getting stabbed or raped went up just from the media lowering the anger barrier. Given the extent of the MSM’s incitement over this it’s probably hundreds by now but they’re being treated as standard crime (which they are but with the anger barrier lowered so a push becomes a punch and a punch becomes a stabbing and a single stabbing becomes a multiple stabbing. You would think a government and its ruling class would want a stable, even-keel society. Instead, they go for an "Anarcho-Tyranny," as a late essayist called it. Divide and conquer. Same plan for almost 200 years. Occasionally involving literal conquest. The Obama Administration has failed to say clearly that the outrage began because three people lied during the controversy’s first days, August 9-12. The only people who identified themselves, spoke and answered questions in the mass media during those days were Dorian Johnson, Piaget Crenshaw and Tiffany Mitchell. They knew each other. They were not scattered witnesses. They coordinated their stories. They all said that that Brown was shot dead in the same place where he turned around and faced Wilson. In fact, Brown charged about 17 yards at Wilson, who retreated and shot in self-defense. Brown’s charge and Wilson’s retreat are illustrated at this webpage …. … where the red cones are Brown’s blood drops and the blue cones are Wilson’s ejected bullet cartridges. Johnson, Crenshaw and Mitchell did not see that part of the event. They lied brazenly in the mass media, and they lied brazenly to the grand jury. They should and could be convicted for perjury. Instead of trying and convicting those three for perjury and thus resolving the controversy properly, the Obama Administration has tried absurdly to prove statistically that Ferguson is a peculiarly racist town. The Justice Department’s report about the Ferguson incident dismissed all three of those witnesses as unreliable. Witness 101 [Johnson] has a misdemeanor conviction for a crime of dishonesty likely admissible in federal court as impeachment evidence. …. Material parts of Witness 101′s account are inconsistent with the physical and forensic evidence, internally inconsistent from one part of his account to the next, and inconsistent with other credible witness accounts that are corroborated by physical evidence. When federal prosecutors and agents challenged the inconsistencies of her accounts, Witness 188 [Crenshaw] conceded that she likely assumed facts that she did not witness herself based on talking with other residents in the Canfield Green complex and watching the news, but was not specific about which facts. …. Witness 118’s accounts are riddled with internal inconsistencies, inconsistencies with the physical and forensic evidence, and inconsistencies with credible witness accounts. Her attention was admittedly diverted away from the shooting when she watched Witness 101 (Dorian Johnson) ducking for cover and she acknowledged that her account was also based on assumption and media coverage. Although Witness 127’s [Mitchell’s] statements are materially consistent with each other, significant portions are contrary to the forensic and physical evidence and inconsistent with credible witness accounts. Witness 127 was unable to give reasonable explanations as to why the physical evidence might be inconsistent with what she remembers, and therefore prosecutors were left to conclude that she inaccurately perceived material portions of the shootings either because of the stress of the incidents or because she was distracted. Accordingly, after a thorough review of the evidence, federal prosecutors determined material portions of this witness’s accounts not reliable …. The implications are clear to people who have studied the evidence thoroughly. However, the implications are not clear to the overwhelming majority of people who have received their information through the mass media. The majority of people still think that there is merely a difference of opinion among the witnesses. Many people saw the same event, but some remembered and interpreted the event one way, and other witnesses did so another way. That is not the way it happened. Those three did not see that part of the event. They concocted a story that was false, and then they told this story repeatedly in the mass media during August 9-12. During those days, those three were the only people who identified themselves and spoke publicly in the mass media. Then a lot of other copy-cat liars followed the example of those three. Eventually the number of people who lied to the police investigators grew to about two dozen. Ultimately, the Department of Justice dismissed those two dozen false accounts and based its decision properly only on about a half-dozen real witnesses who described Brown’s charge at Wilson. The DOJ report is superb, but failed to explain that the public outrage was based on a lot of people in the neighborhood lying. Doesn’t matter. They’ll never be held to account for it. The real question is how much use we can get out of the fact that they do have blood on their hands. And I think the racist “dog-whistling” Obama has done for the last 7 years qualifies him to be included with these two. This one is easy, but not exactly for the reason you think, but this instead: It’s no fun to trample on the already downtrodden. Whoever they arrest for shooting at the cops will just be (I would be willing to bet) just another POS with a record a mile long. If he hadn’t shot the cop, he would be going to jail soon anyway or end up dead in some drug altercation. The jails are already full of his kind – we got a million of them. But, to take a promising young man with everything before him, a member of the elite (not really – despite the tux he was probably more of a hick than an elite) and to show HIM that he is no better (in fact worse) than the rest of us – THAT’s pure schadenfreude joy. Wolfe long ago spoke of the Great White Defendant. In his book, he was a Wall St. banker who lived on Park Avenue, but in our reduced circumstances, you gotta take what you can get – “White Hispanics”, cops who shoot in self-defense, frat boys from hick states, etc. Eric Holder probably has the blood of a few dozen on his hands, couple hundred maybe – not sure how many the ‘Fast & Furious’ gun-smuggling killed. Soros must have the blood of thousands on his hands though, he & his NGOs took part in the successful wrecking of Ukraine. And what about Soros' involvement in the UK? Wikipedia claims that his company's massive short selling of the British pound (Black Wednesday) and the ensuing financial costs to the UK government and economy, helped Labour to regain Parliament and ended with Tony Blair becoming Prime Minister a few years later. Soros is thought to have made over one billion pounds from the incident. Talk about killing two birds with one stone. And at a cost to British taxpayers of only 3.3 billion sterling! And he had been an immigrant to the UK --I didn't know they had fraternities at the LSE! The United States is one of many dozens of countries in which Soros has financed violence. Holder is a incomoetent amateur in comparison. After watching this, I am starting to understand why the south was so bitter about reconstruction. At least the small community that Mohammed runs is 96% African American. AFAIK, the MSM has followed the police line that Begich was murdered for "being in the wrong place at the wrong time". Once I was in the wrong place at the wrong time, I got in the express checkout ans I had like 20 items. Naturally I was murdered. Oops, I guess I wasn't. And it's filthy lie that Begich was murdered because he was in the "wrong place" unless St. Louis is one giant no-go area. The whole "wrong place" narrative is so painully obvious. It's a motiveless crime, complete random desire to kill, until you know that the killers were chanting "Kill the white people." Then it all makes sense, it was ethnic cleansing, ironically targeting a Bosnian, but only because he's white. And that's why the truth is being kept buried. You would think a government and its ruling class would want a stable, even-keel society. Instead, they go for an “Anarcho-Tyranny,” as a late essayist called it. Ultimately, our rulers (to use Mancur Olson's terms) are roving bandits, not stationary ones. They refuse to get with the "vertical transmission" (mutualism) program. They reject "noblesse oblige". The University of Oklahoma singalong was in the Top Stories section of Google News for at least three days straight. The Ferguson shooting seems to have dropped off the page after less than two days. Both incidents had shocking video evidence. What’s the difference? Just another shooting in a black neighborhood I guess, hardly the most important place on earth. Eric Holder probably has the blood of a few dozen on his hands, couple hundred maybe - not sure how many the 'Fast & Furious' gun-smuggling killed. Soros must have the blood of thousands on his hands though, he & his NGOs took part in the successful wrecking of Ukraine. And what about Soros’ involvement in the UK? Wikipedia claims that his company’s massive short selling of the British pound (Black Wednesday) and the ensuing financial costs to the UK government and economy, helped Labour to regain Parliament and ended with Tony Blair becoming Prime Minister a few years later. Soros is thought to have made over one billion pounds from the incident. Talk about killing two birds with one stone. And at a cost to British taxpayers of only 3.3 billion sterling! And he had been an immigrant to the UK –I didn’t know they had fraternities at the LSE! The number of dead cops is a mere bagatelle compared to those they slaughter. Sailer’s sniveling about the wrong thing. But no condemnation of the use of violence by “public safety officials” against those looted to pay their inflated salaries. The problem with deporting internationalist trouble makers is they just move to some other country and cause trouble there. As a particularist I think western countries need to establish a two-tier system of citizenship – one for those who support nation states and one for those who don’t. Since internationalists don’t respect national sovereignty why should they experience the benefits of full citizenship? I’m not suggesting all their rights should be taken away, but they certainly shouldn’t be able to meddle in national politics. War is the health of the State. It’s a pretext for usurping power from the people. Ultimately, our rulers (to use Mancur Olson’s terms) are roving bandits, not stationary ones. They refuse to get with the “vertical transmission” (mutualism) program. They reject “noblesse oblige”. Like Fidel Castro, Eric Holder and his boss got their jobs through the New York Times. How about a human interest story on how residents are feeling? C’mon NYTimes, how about the little people?